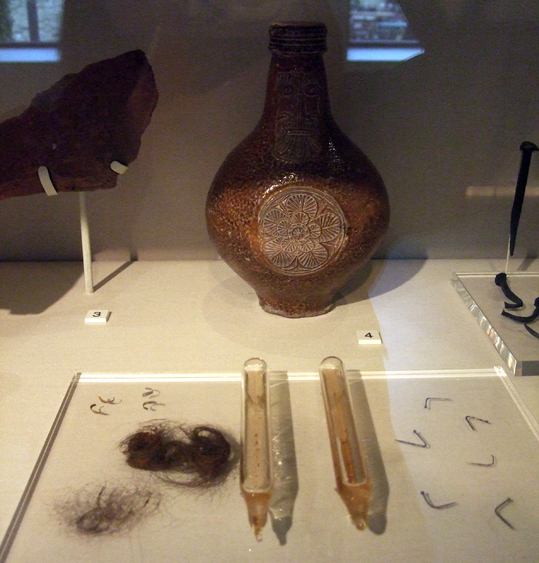 This is a witch bottle and the things found inside it when it was opened. It is on display at the Royal Naval College visitor centre in Greenwich - which also happens to be in the grounds of Greenwich University, where I am currently studying. As well as doing an English Literature MA, I've been enjoying exploring the site - which has quite a bit of occult history. During the 16th and 17th centuries, bottles like this were used as charms against a witch's spell. They would be placed at the entrance to a dwelling to stop the witch entering. It is very unusual to find such a bottle with its content intact. Investigations by Dr Alan Massey of Loughborough University revealed its contents: urine, human hair and metal pins. To be honest, I would say the description isn't entirely accurate. From what I have heard, witch bottles were intended to protect a building and its inhabitants against malefic magic rather than to physically prevent any witch from entering the property. People still use witch bottles today. Modern cunning man George Hares told delegates at the Nameless Arte conference that he had used a witch bottle when he believed someone was wishing him ill. He boiled up a mixture of his own urine and hair with pins in a bottle and asked that the malefactor present themselves to him and that their curse be broken. He claimed the witch bottle spell worked perfectly.